Swing SetThis sturdy wooden swing set is an ideal way to add excitement to your backyard. Children can enjoy hours of sunshine and exercise climbing up the 5’ Step and whooshing down the 10’ Wave Slide. Let them view the world from a different angle using the Trapeze with Rings. The Sling Swings’ quality seats and pinch proof covers on the chains make riding these swings a delight and the Horse Glider gives a fun variation to their float through the air experiences. Swing SetLoads of laughter and pleasant days await with this wooden swing set. With a 5’ Step leading to an 10’ Wave Slide along with two Sling Swings, this swing set provides the key favorites from the park for your children to enjoy in the safety and convenience of your own backyard. And don’t forget the youngest ones! Delivery and set up does not include ground preparation. ​Item ID: #102Happy Space SaverThis happy swing set can turn a tiny space into huge fun and overflowing imagination. It is perfect for small backyards, using vertical area to increase playtime room. 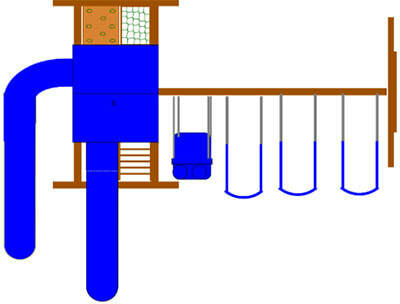 Children will enjoy the freedom of soaring on the two Sling Swings, climbing the Steps, checking out far off places with the Super Scope and taking an exciting ride down the 10‟ Wave Slide. Lots of family memories and healthy exercise will be enjoyed with this Happy Space Saver in your backyard. ​Item ID: #103Extreme Space SaverCalling all climbers! This set is perfect for children that love to climb. With a 7’ floor level there is plenty of height to challenge your adventurous ones. They can climb up the 7’ Rock Climb and swoosh down the 14’ Scoop Wave Slide. For a less adventurous climb to the top the 7’ steps will get them there as well. There is a lot of fun packed into this Extreme Space Saver wooden swing set. 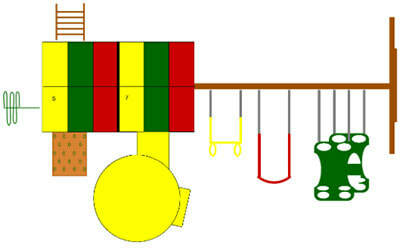 ​Item ID: #105Simple Joys Swing SetCapture some health and recreation answers with our Simple Joys wooden playset. This no-frills swing set offers plenty of old time delights. Two Sling Swings and a Trapeze Bar ensure countless hours of swinging fun and a 10' Wave Slide further adds to the joys. The roomy tower offers plenty of opportunities for "camp meetings," "tea parties," or whatever other activities your child can dream up. Choose this wooden swing set and you will be set up for years of simple joys. ​Item ID: #111Family Favorite Swing SetAre you ready for some old fashioned fun? Take a look at the Family Favorite wooden swing set, a top selling unit that provides a lot of play value at a modest price. 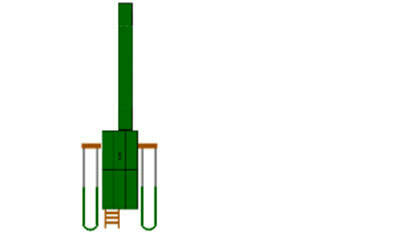 The tower features a sturdy 4'x5' platform with a high-quality canopy overhead and a roomy sandbox beneath. Attached to this tower is a 4 Position Easy Ride Attachment Beam, a 5' Step, and a 10' Wave Slide, creating the perfect setting for many favorite family memories. ​Item ID: #115Childish Glee Swing SetAdd a splash of color and cheer to your backyard with the Childish Glee wooden swing set. It sports a happy little tower connected to a 3 Position Easy Ride Beam. Your youngsters will spend hours under its cheerful influence, swinging to their heart's content, building sandcastles together, climbing the Cargo Net or holding top secret meetings in the safety of their "tree house." Choose this swing set as a wonderful playmate for your children and plant smiles in your backyard for years to come. ​tem ID: #120Family Fun Swing SetYou will want to gather the whole family around this multi-purpose swing set. It offers a lot of creature comforts for little Family Fun times. The youngsters can clamber all over the upper deck of the tower, swoop down the Scoop Wave Slide, climb the Steps, or point their toes toward the sky on the Sling Swings. Purchase this swing set and sweet summer memories are bound to follow. 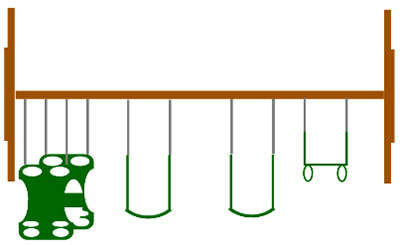 ​Item ID: #130Jolly Fun Swing SetSpice up your life with the Jolly Fun Swing set from Play Mor Swing Sets. Enjoy a savory burger with the family at the built-in picnic table under the main 4’x5’ deck. Work off some calories as you push the children on the swings or assist them on a ride down the Wave Slide. You will all have a jolly time in the safety of your own backyard as you enjoy the offerings of this handsome little swing set. Item ID: #142Treasured Times Swing SetInstall a favorite destination at your home with the Treasured Times wooden swing set. Plan a "staycation" for the children this summer by investing in your own backyard playground. 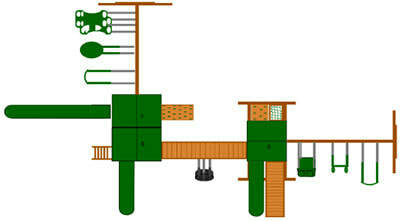 This set attractively offers swinging, climbing, sliding, and dining possibilities in the safety of your own property. Cherish your children and spend time with them while you can. Years later you will be grateful for all the treasured times you created. ​Item ID: #211Scenic Pointe Swing SetYour children’s playtime fun will skyrocket with the Scenic Pointe Swing Set. Steps and a gang plank lead to the tower with its Steering Wheel and Super Scope. More challenging ways to climb are the 5’ Pipe Climb, the 5’ Rock Climb, the Pipe Climb Ladder, or the Deluxe Rope Ladder. A curvy ride on the Scoop Wave Slide will take your adventures to the ground where several swing styles are also included — a Horse Glide, two Sling Swings and a Tire Swing. Add this play set to your backyard, and many joy-filled memories are sure to be in your future. ​Item ID: #237Climber's Joy Swing SetYour children’s playtime fun will soar with the Climber’s Joy Swing Set. Climb up the 5’ Steps then scramble across the platform and through the 5’ Side Winder Slide to the ground. A Single Cedar Roof protects the tower and its Steering Wheel and Super Scope. More challenging ways to climb are the 5’ Pipe Climb, the 5’ Rock climb, the Pipe Climb Ladder, or the Deluxe Rope Ladder. A fast ride down the 10’ Scoop Wave Slide will take your adventurers to the ground where several swing styles are also included – a Horse Glider, a Molded Tire Swing, two Sling Swings and a Disc Swing. With this swing in your backyard, many joy-filled memories are sure to be yours. Item ID: #505Golden Moments Swing SetYour children will treasure their little days with the Golden Moments Swing Set. They can while away happy hours on the Swings and twirling on the Disc Swing to their heart's content. Even the youngest one will be happy in her safely crafted Baby Swing. From building castles in the Sandbox to playing make-believe with the Steering Wheel and Super Scope, children will make moments to remember forever. Item ID: #511Deluxe Delight Swing SetDelights abound on this deluxe wooden swing set. Your youngsters will probably start by romping up the Gang Plank and swooping down the 14' Scoop Wave Slide. When they are tired of that, they are likely to tackle the challenging Rock Climb or the tantalizing Swings. Finally, when they are almost worn out, the Sandbox will offer them hours of excavating fun within its roomy sides. There is no doubt that this swing set is bound to please. Brighten your backyard with its delights this year. Love and Laughter Swing SetLovely evenings of warm summer sun, soft laughter floating on merry breezes. . . Take in the fun as your youngsters enjoy the Love and Laughter playset from Play Mor Swing Sets. The 14’ Scoop Wave Slide issues a rush of adrenaline for little riders. A 10' high 4 Position Swing Beam thrills little hearts with its soaring capabilities. Vigorous exercise awaits ready hands and feet on the Deluxe Monkey Bar Attachment and 7' Rock Climb. These fun activities and more await your family upon the purchase of this lovable playset. Item ID: #535Deluxe Supreme Swing SetAs its name suggests, this outstanding wooden swing set is absolutely loaded. A carefully crafted Gang Plank affords easy access to the lofty Deluxe Sky Tower. A daring 7' Rock Climb challenges any youngster's climbing abilities. A 14' Scoop Wave Slide provides a quick adrenaline rush. Attached to each end of the tower are more exciting additions. The Monkey Bar Climber affords muscle-toning exercises while the High Ride Swing Attachment provides a ticket to hours of thrilling fun. Last but not least, at ground level a built-in Picnic Table and Sandbox offer delights of an even different flavor. Purchase this premium swing set and enjoy its pleasure for years to come. Item ID: #828Happy Hour Play Place Swing SetGet playtime off in full swing with the Happy Hour Play Place Swing Set. The children have the choices of hanging upside down on the Trapeze with Rings, or propelling skyward with the Sling Swings. The youngest have a Baby Swing to ride so they too can join the fun. The Gang Plank leads the way for them to try one of the Slides or pause and play with the two Steering Wheels, 2 Super Scopes, or Binoculars. A Sandbox adds to the fun.